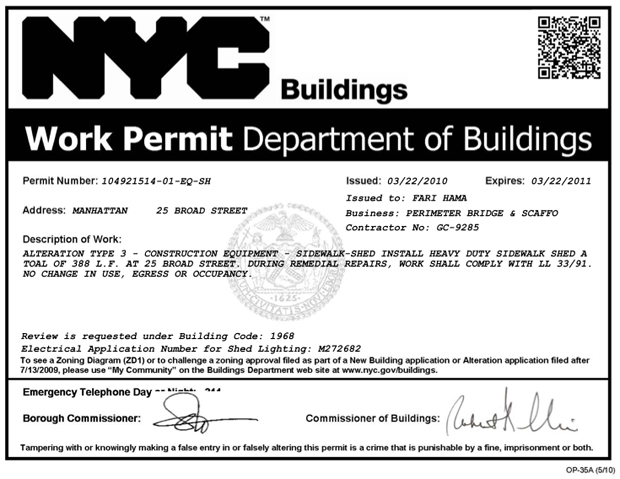 New York City Mayor Mike Bloomberg unveiled a system of QR tags today meant to give citizens quicker access to information about new construction projects. The QR codes will be posted on every construction permit city-wide; by downloading a QR reader app on any smartphone, city-goers can scan these codes to see a web view of what’s being built, who is doing the building, and what (if any) complaints have been filed against the permittee. While QR codes are kind of a technological snore, the mayor’s office deserves credit for implementing a system that expects citizens to have a mobile web browser. Specifically, the Department of Buildings Commissioner Robert Limnadri suggested installing the codes after seeing them used in a variety of ways but never as a way to instantly answer questions about construction from always-curious New Yorkers. The move will pay off in the long run, as those QR codes can be made to link to almost anything on the Web. A safer–but far lamer–choice would have been something like an SMS messaging service. The Mayor also indicated his office is looking for other ways to deploy QR codes to bring information from the web to the street level. “Once you get this to work in one way, there’s an awful lot of things you can do. And we’re committed to that,” he said before being peppered with questions about Carmello Anthony. Right now, scanning a construction site QR code will open a link to a mobile version of a city website containing publicly available information on the project (the information is currently searchable through the web). But it’s easy to imagine contexts where QR codes on a historical site, for example, could link to videos or audio that would wow tourists. In a small press event in downtown Manhattan, the mayor cited the precedence of QR codes in newspapers advertisements. “This is a good example if what’s happening in the real world,” the mayor said, drawing a parallel between his administration and the private sector. The mayor also recently announced a revamped 311 service that uses the web to display civil complaints (like noise violations) on a map, with information on the progress of the complaint. The increased use of QR codes should be good news for users of QR apps for Android and iPhone (many phones with cameras, even older models, come pre-installed with an app, but they’re available for free in Apple and Android stores). “The more people that download QR software on their smartphones, the better this will work,” Bloomberg said.